She walked 46 miles with him in her arms. It was Heather Bolint's lifelong dream to hike the Appalachian Trail, the famous course that runs 2,190 miles from Maine to Georgia. And in June, she started hiking it, from Maine. 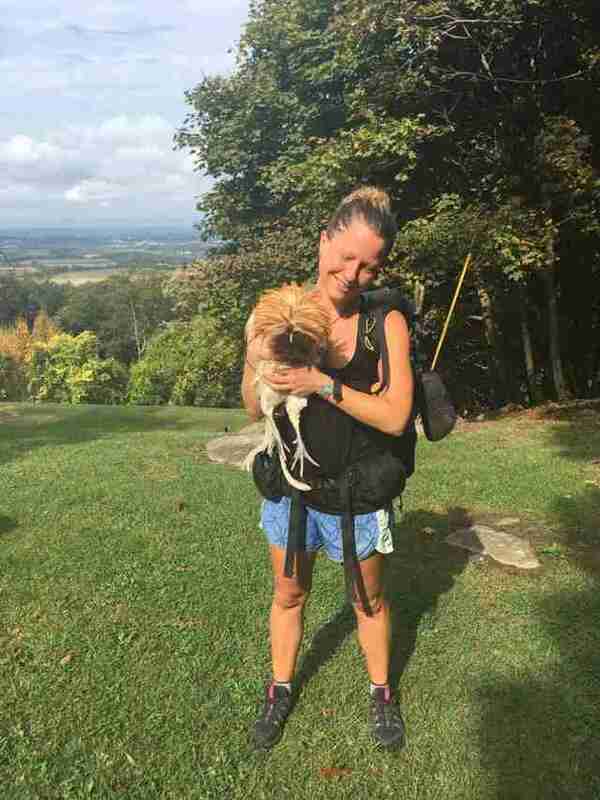 Little did she know that when she reached Pennsylvania, three months after she started the trail, she would meet a very special hiking buddy. "So this happened," Bolint wrote this week on Facebook. 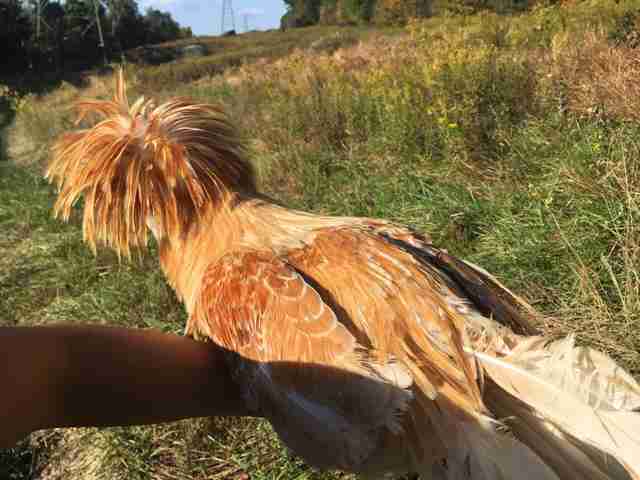 "Yesterday I found a 'Polish crested' rooster in the middle of the trail near a road with no houses." 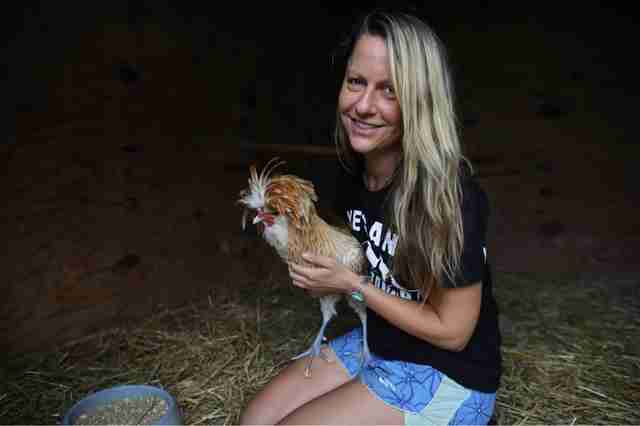 Bolint is an animal lover and a self-proclaimed "chicken whisperer." 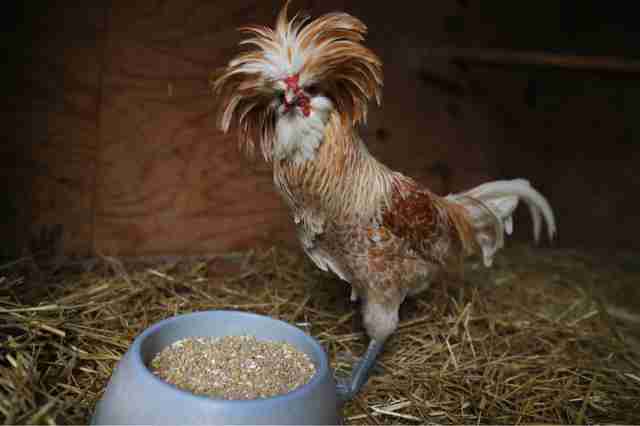 That this rooster, with very distinctive feathers, was just standing there seemed like nothing less than kismet. Bolint knew that the domesticated farm animal wouldn't survive out there in the wilderness, with all the coyotes, hawks and other predators around. "I was able to scoop him up," she said, "and decided the only thing to do was to start hiking with him." Heather was just north of the Mason-Dixon line and it was hot out. 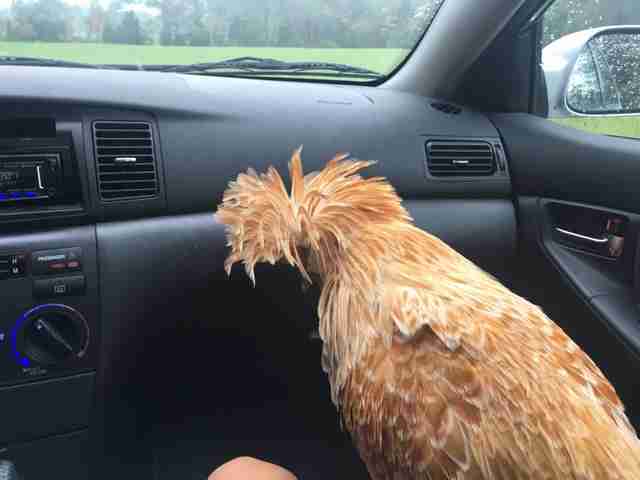 But the rooster, whom she called Eddie, just calmly nestled up to her. 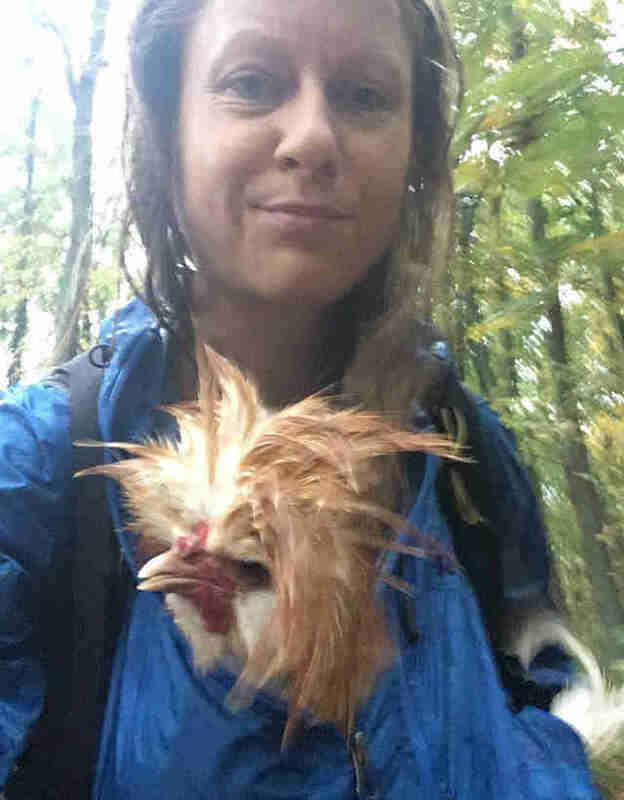 "I held him in my arms and continued 15 more miles in 80 degree, humid weather until the sun began to set," she said. As they hiked together, Heather and Eddie met nice people along the way. 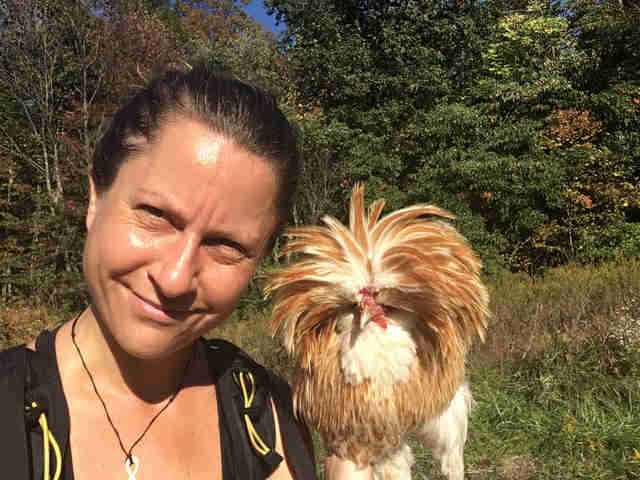 Some even wanted their picture taken with the hiking rooster. Eddie was more than happy to oblige. 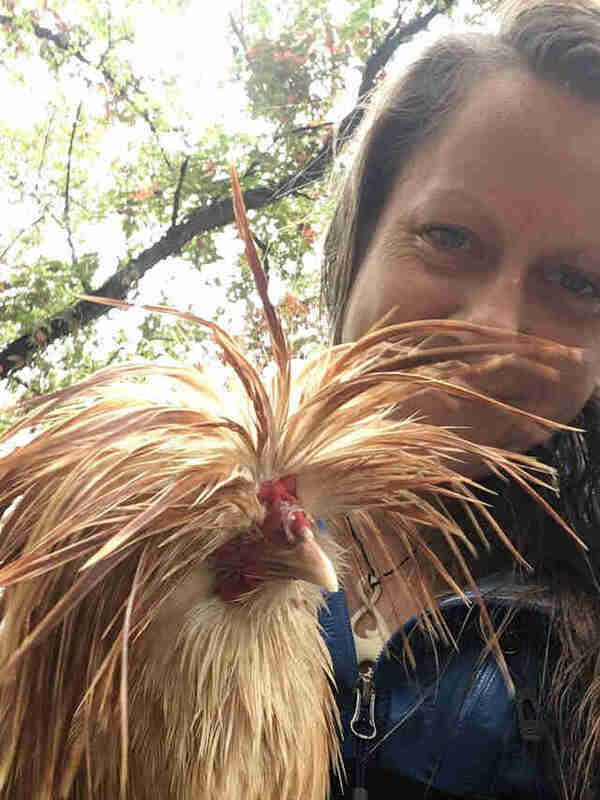 "He hardly ever made a peep and was quite content with just sitting in my arms or in my raincoat while we hiked," Bolint said. When it got dark, Heather and Eddie set up camp. At the campground, Eddie had a chance to meet even more nice hikers. 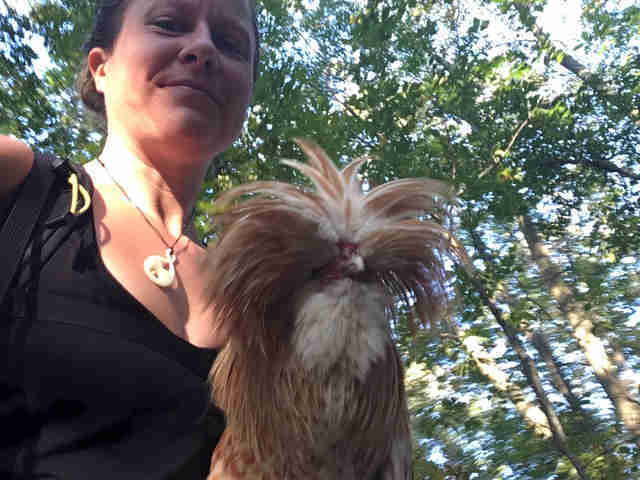 "A nice guy at the campsite (and fellow chicken lover) gave him some of his dog's kibble to eat. I also fed him oatmeal, nuts and apple cores," Bolint said. Bolint needed to get some rest, so she went to sleep. So did Eddie. "He peacefully slept in my tent with me for two hours," Bolint said. 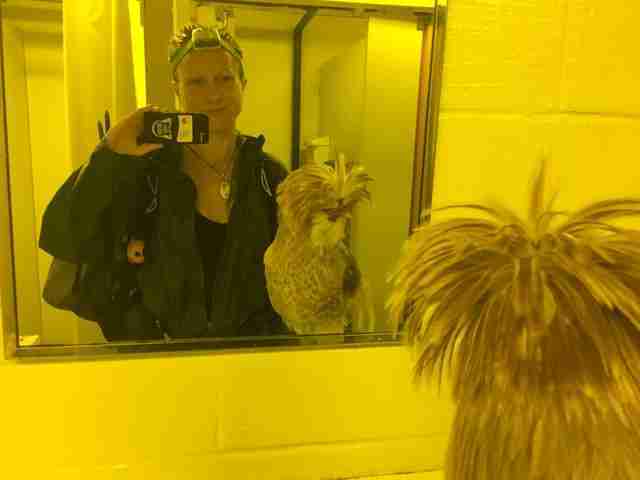 "Then we got up at midnight to continue hiking to Harper's Ferry in the coolness of the night (and to beat the rain)." 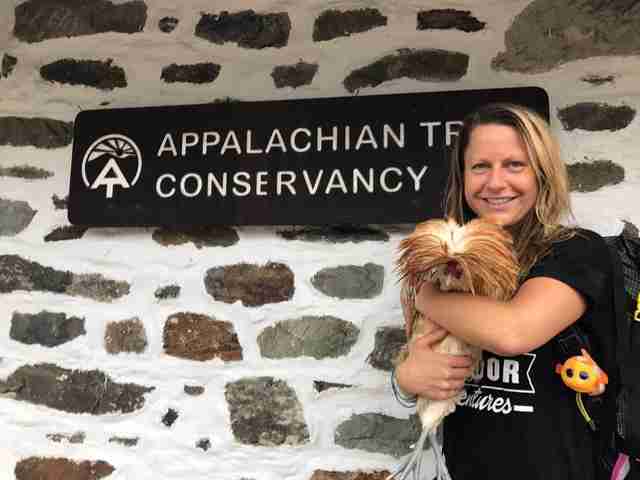 Bolint and Eddie hiked 27 more miles to reach the Appalachian Trail Conservancy headquarters in West Virginia, where they arrived in the late morning. They had set foot in three different states and had covered 46 miles together by then. When Bolint and Eddie entered the building together, the staff remarked, "Now we've seen everything." 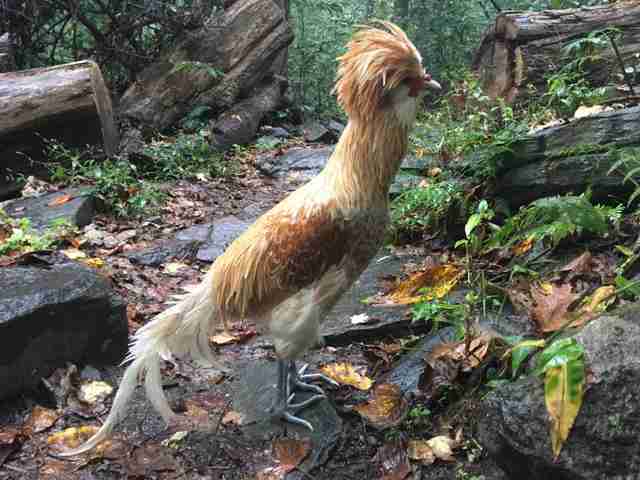 It's believed that Eddie is the first rooster to ever hike the famous trail. But it was time for Bolint to think about Eddie's future. She decided to find a forever home for him and found out about Poplar Spring Animal Sanctuary in Poolesville, Maryland. So it was time for Eddie to take a drive. "I wanted to make sure he was happy and healthy, and living a life he wanted," Bolint said, who added that he seemed to enjoy the car ride, as well as the "bathroom selfies, being held by random strangers and trail life in general." 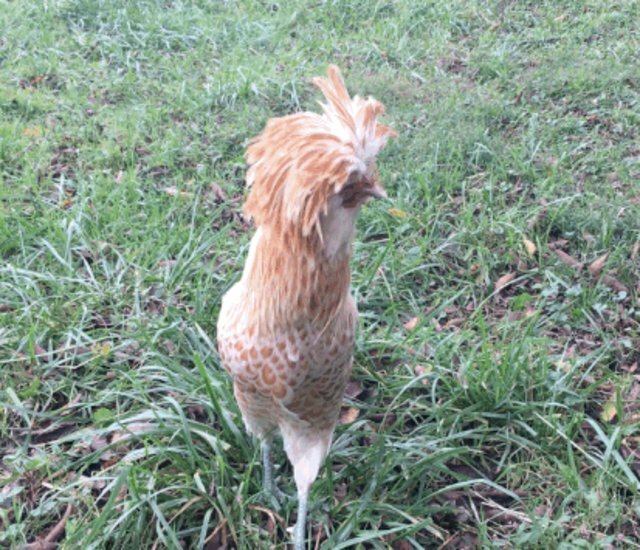 Eddie settled in perfectly at Poplar Spring, where the people at the sanctuary were more than happy to have such a charming rooster. There was only one problem. 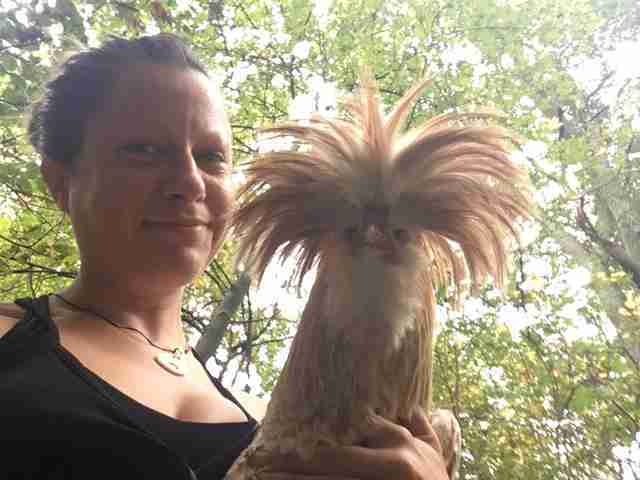 "I named him Eddie, but the sanctuary named him Mason because they already have a peacock named Edward," Bolint told The Dodo. 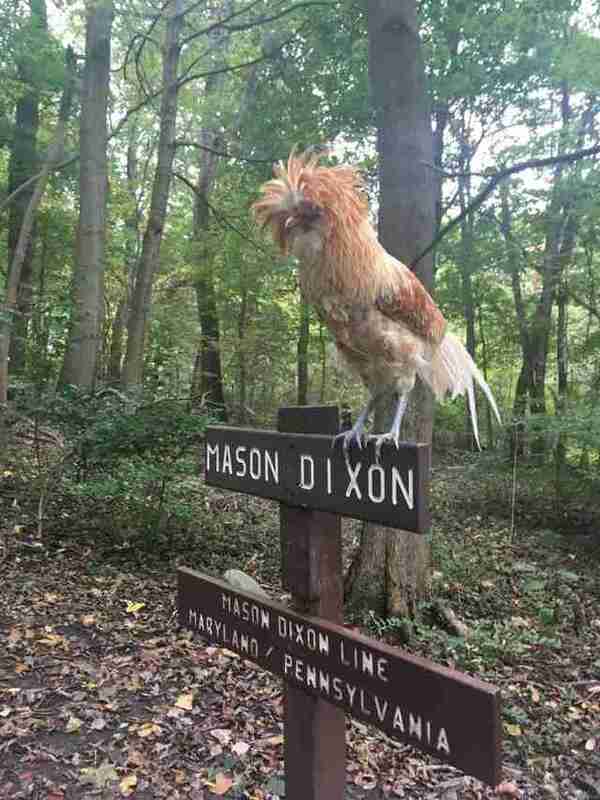 In a way, it's perfect — this way people will always remember that he was found at the Mason-Dixon line on the famous Appalachian Trail. 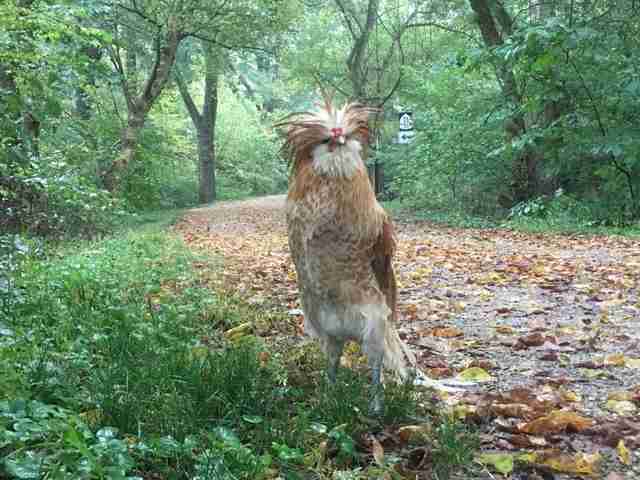 And people won't soon forget the rooster's impact on the trail. 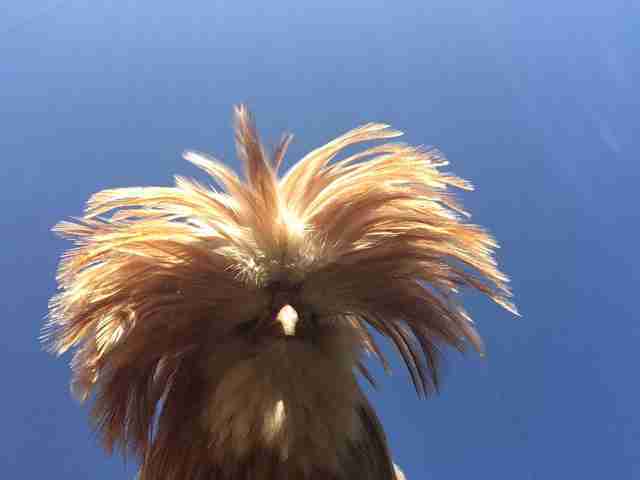 "When people saw him they instantly smiled, and sparked up friendly conversation," Bolint said. 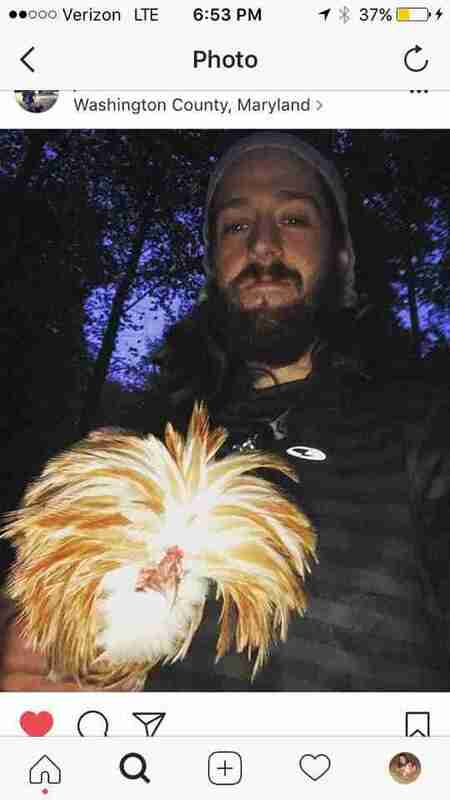 "I'm so grateful that I got to experience life on the trail with a rooster, and to witness the joy he brought to others." Mason now has new friends to meet at his beautiful new home. "Now he will be able to live peacefully ... and dream of that time he once hiked the Appalachian Trail," Bolint said. She had continued hiking and hopes to be finished with the whole trail by Christmas. 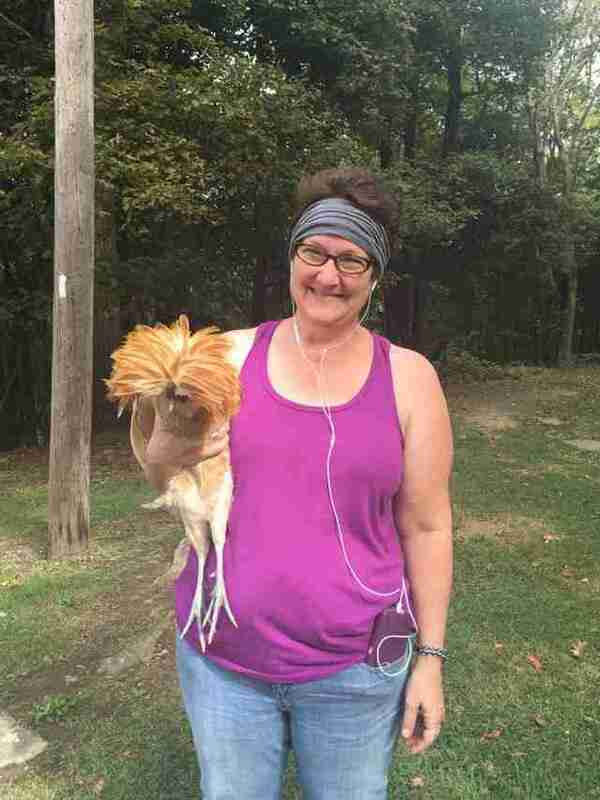 "This little guy was the sweetest rooster," she added, "and totally stole my heart." Help welcome Mason to his new home by donating to Poplar Spring.